This will be the last post for this year, maybe forever. The PEGAS project has run its course, in fact it has run beyond its initial 3-year time frame. If additional funding is secured the project will continue. This article on great ape trafficking and the project’s work just appeared in The New York Times . 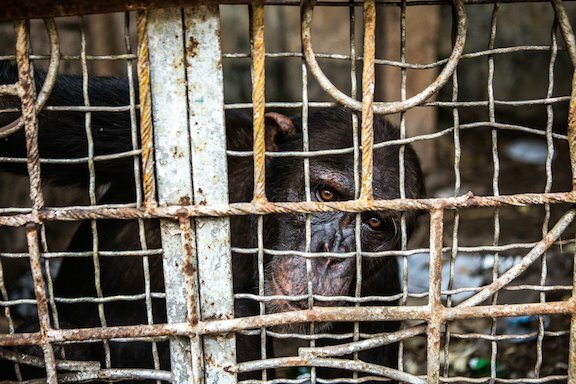 The New York Times tracked international ape smugglers from Congolese rain forests to the back streets of Bangkok. Here is what unfolded. MBANDAKA, Democratic Republic of Congo — The sting began, as so many things do these days, on social media. “I was way out on a limb,” Mr. Stiles admitted later. But he was eager to bring down Tom, who indicated that he could find orangutans and chimps with only a few days’ notice, the mark of a major dealer. 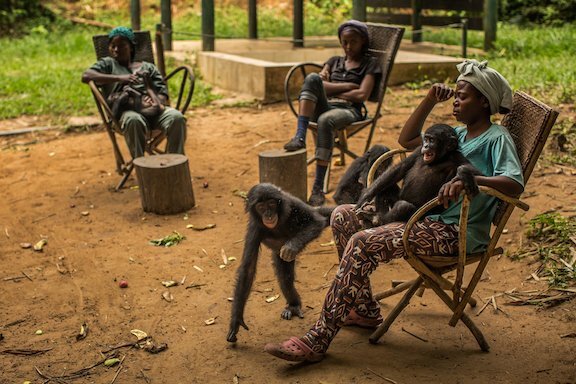 Employees of the reserve, Lola Ya Bonobo, with young rescued bonobos in its nursery. Wildlife researchers say that a secret ape pipeline runs from the lush forests of central Africa and Southeast Asia, through loosely policed ports in the developing world, terminating in wealthy homes and unscrupulous zoos thousands of miles away. The pipeline, documents show, is lubricated by corrupt officials (several have been arrested for falsifying export permits) and run by transnational criminal gangs that have recently drawn the attention of Interpol, the international law enforcement network. Apes are big business — a gorilla baby can cost as much as $250,000 — but who exactly is buying these animals is often as opaque as the traffickers’ identity. Many times, researchers say, they can only begin to track where the apes have ended up by stumbling across the Facebook posts and YouTube videos of rich pet collectors. Wildlife officials said that a handful of Western businessmen had also been arrested. But the majority of recent busts, they added, have been in Africa or Southeast Asia, usually of low-level traffickers or poorly paid underlings, not the bosses who control underground exports and travel abroad to make deals. For years wildlife officials suspected that a mysterious American known simply as “Joe” was running a large trafficking ring out of Thailand, one of the world hubs for smuggled apes. 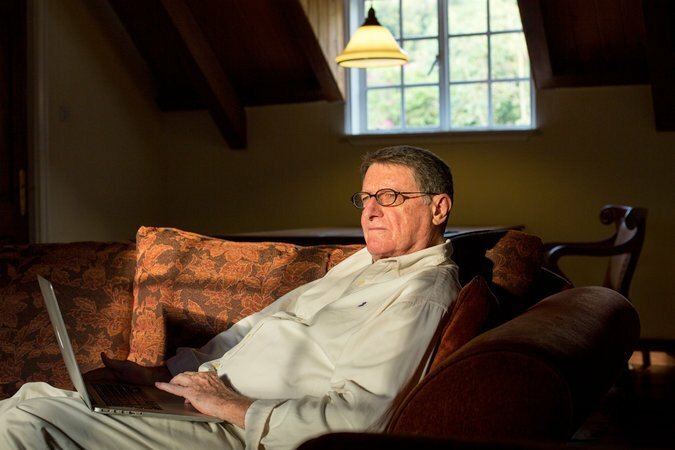 According to “Tom,” the trafficker Mr. Stiles discovered, “Joe” had recently retired. And it’s not as if smuggling is the only threat apes face. The world’s hunger for biofuels and palm oil — a cheap food product used in things like lipstick, instant noodles and Oreos — is leveling tropical rain forests and turning them into farms. According to the Arcus Foundation, a nonprofit group that studies apes, Indonesia and Malaysia have tripled their palm oil production in the past 15 years, wiping out the habitats of thousands of orangutans. In Africa, it’s the same, with new rubber plantations, new roads and new farms cutting deeply into gorilla areas. One species, the Cross River gorilla, is now so endangered that scientists think there are only 200 or 300 left. Most apes, which include gorillas, gibbons, orangutans, chimpanzees and bonobos, live deep in the rain forest. The Basankusu region of Congo, lying along a tributary of the legendary Congo River, is one of the last bonobo refuges and a source of many trafficked apes. It’s not easy getting here. 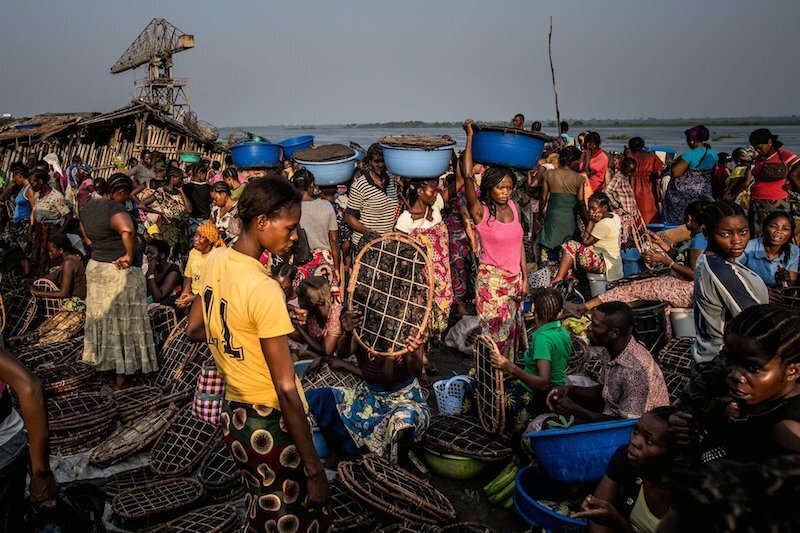 We flew from Congo’s capital, Kinshasa, to Mbandaka, a river town where 50-foot dugout canoes arrive every morning, edging into shore crammed with products of the forest: onions, eggplants, buckets of red-skinned peanuts, dead pangolins, dead turtles, dead monkeys and, occasionally, live apes. From Mbandaka, we hired a canoe and motored upriver, our long, narrow boat slicing through the tannin-rich water like a pencil. We made it to the bonobo habitat, amazed to see wild bonobos quietly staring down at us from the highest branches of the trees. Antoine, a captive chimpanzee at a hotel in Mbandaka, Congo. He escaped in January and was shot by the police. As one leaves the towns and travels into the thick forests, the use of apes changes. Out here, as in remote parts of Southeast Asia, where many people are poor and desperate for protein, apes are also food. Jonas Mange, who now works on education projects for the African Wildlife Foundation, used to hunt bonobos in Congo, venturing into the shadowy recesses of the forest and laying snares made from loops of twisted wire. If he discovered an adult bonobo in one of his traps, he would quickly shoot it with a shotgun and sell the meat, usually for a few dollars per carcass, if that. But a baby was different, he said. There was a specific market for infant apes, so he would sell them alive, for at least $10 each, to local traders who would then smuggle them to Kinshasa and sell them to foreigners for many times that amount. “Bonobos are clever,” Mr. Mange said. If they get their feet stuck in a trap, they don’t screech wildly in panic, like pigs or other animals, which would reveal their location to the hunters. Instead, he said, bonobos quietly try to untangle the snare without being detected. 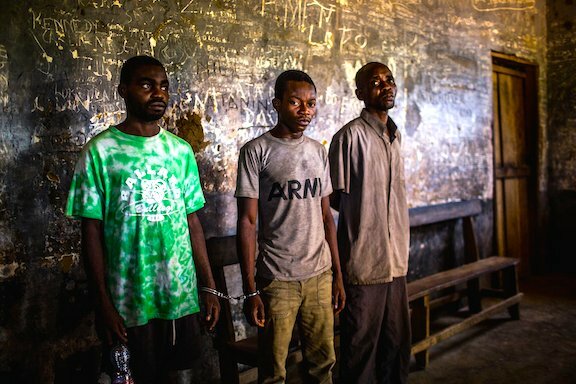 In Boende, a small town up another tributary of the Congo River, three hunters were recently caught with bonobo carcasses and sentenced to several years in a stifling colonial-era prison. The men said they were simply trying to feed their families by selling bonobo meat. But poaching an ape is a serious crime in Congo, and nonprofit wildlife groups have been assisting the Congolese authorities in prosecuting offenders. Mr. Kesidi expressed some sympathy for the hunters he had just jailed, saying that the prison where they were housed was a horrible place where many prisoners had died. For years, Mr. Stiles has performed undercover research on wildlife trafficking across Africa, but recently his work has taken him off the continent. A big, freckled, gregarious man, he favors wearing baggy shorts and wrinkled safari shirts. He has also invented several false online identities, with webpages that depict him as an active buyer of rare animals. Many illegal wildlife transactions start online, specifically through Instagram or WhatsApp. Mr. Stiles has made several trips to the United Arab Emirates, which he considers a new hub for the illegal online wildlife business. Dealers in the Middle East have posted many pictures of apes for sale, sometimes advertising them as friendly pets for children. Disturbing stories often lie behind those pictures. Many chimps have been drugged with muscle relaxers or alcohol to make them easier to handle. Some are trained to smoke cigarettes and guzzle beer. Orangutans are gentler than chimps, but still, they are not always gentle, and investigators say zoo trainers sometimes beat them with lead pipes wrapped in rolled-up newspapers to force them to perform tricks. Several years ago, the Indonesian police rescued a female orangutan who had been shaved and was being used as a prostitute at a brothel. It’s relatively easy to falsify permits, though, and wildlife investigators have tracked illegally sold apes to Iraq, China, Dubai and Bangkok’s Safari World zoo, where orangutans have been trained to wear boxing gloves and spar with each other to howls of laughter. Safari World was outed more than 10 years ago for using orangutans that had been smuggled from Indonesian jungles. Dozens of animals were seized from the park and flown home, where the wife of Indonesia’s president welcomed them. But the boxing shows continue, with a new set of animals, despite an outcry from wildlife groups. Safari World executives said that none of their animals were abused and that the orangutans were fed “human-grade fruits” and lived in air-conditioned rooms. They also said it wasn’t their fault that the authorities had discovered that some of their orangutans had been improperly acquired from Indonesia. Safari World said it relied on third-party suppliers, and the zoo insisted that most of its apes had been born in Thailand. To arrange his orangutan sting, Mr. Stiles checked into the Landmark hotel in Bangkok. From a quiet room overlooking clogged arteries of traffic, he began sending the wildlife trafficker Tom messages on WhatsApp. Daniel Stiles, a self-styled ape detective who lives in Kenya. Mr. Stiles knew it was dangerous to flirt with a known smuggler. So he brought his investigation to Freeland, a nonprofit group that combats wildlife and human trafficking from a large office in central Bangkok. Freeland works in secrecy, with undercover agents based in a sealed room that other employees are not allowed to enter. It also works closely with the Thai police services, including one cheerful undercover officer who goes by the name Inspector X. Over the next few days, with Inspector X and other agents lurking in his high-rise hotel room, Mr. Stiles exchanged more WhatsApp messages with Tom, trying to arrange a meet-up. A couple of times, they even talked on the phone. Tom’s real identity remained a mystery. He had a Malaysian or Indonesian accent, spoke English fluently and was never at a loss for words. In late December, the day of the meet-up, Inspector X and the other Thai agents staked out the appointed location — a supermarket parking lot in central Bangkok. A taxi pulled up. Inspector X and the agents pounced, arresting the driver and discovering two baby orangutans in the back seat, clutching each other. They appeared scared but healthy, and have since been sent to a Thai wildlife sanctuary. But Tom was nowhere to be found. Mr. Stiles was overjoyed that the orangutans were rescued, but he was frustrated, too. “We got to get to the dealers,” he said. Since the sting, he has been back on Instagram, looking for more apes. And more Toms. This entry was posted in online trafficking, PEGAS, trafficking and tagged ape trafficking, New York Times, PEGAS, sting. Bookmark the permalink.